This past Tuesday was my younger sister's birthday. My daughter and I schemed together and organized a little surprise party for her. We invited 2 of her best friends, and booked a gourmet olive oil/balsamic vinegar tasting party and luncheon at a local boutique. If you're not familiar with these, they are kind of like a wine tasting for foodies. You can look at a link HERE. Anyway, I wanted to make a little party favor for each guest to take home and decided to put together a little file folder notebook so we could write down our favorite pairings, recipe suggestions and the like. 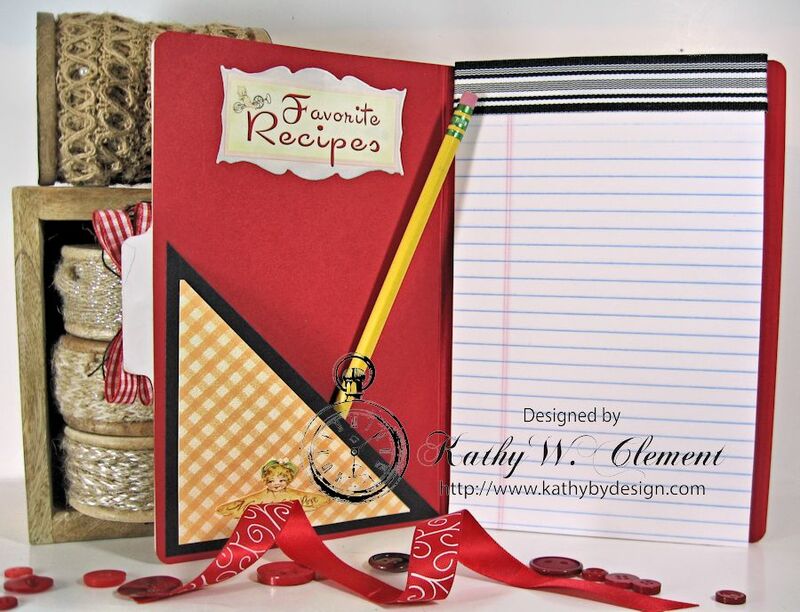 The base folder is made with heavy weight red cardstock. I printed out the cute file folder design on the front from my Crafty Secrets Retro Kitchen Kit, sizing it so that I could fit a junior legal pad on the inside. Then I loaded them up with ribbon to make them really cute! To keep with the kitschy color scheme of the project, I layered a double row of 5/8" wide black plaid ribbon, using Scor-Tape to hold it in place. I wrapped it around the sides of the file folder before I glued the front onto the base so that the edges would be nice and neat. 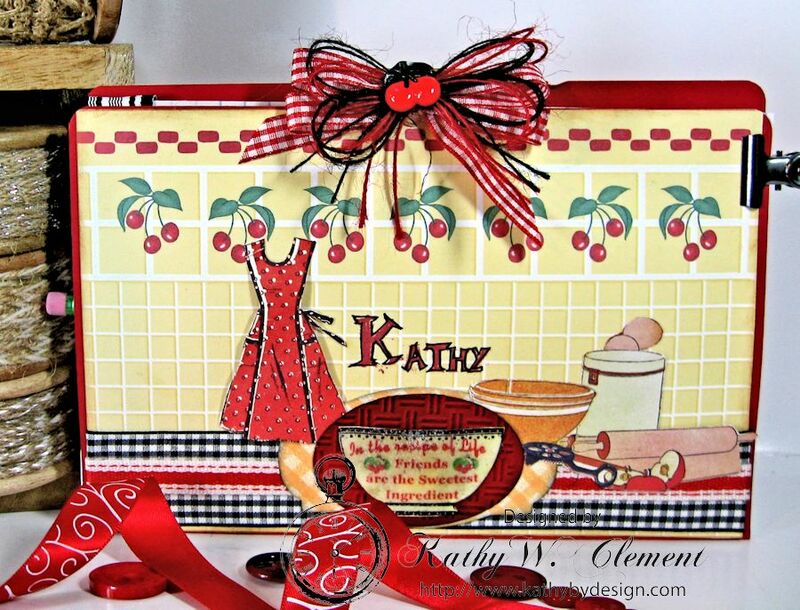 I added a layer of Red Canvas Color Band Ribbon in between the two rows of black plaid ribbon. 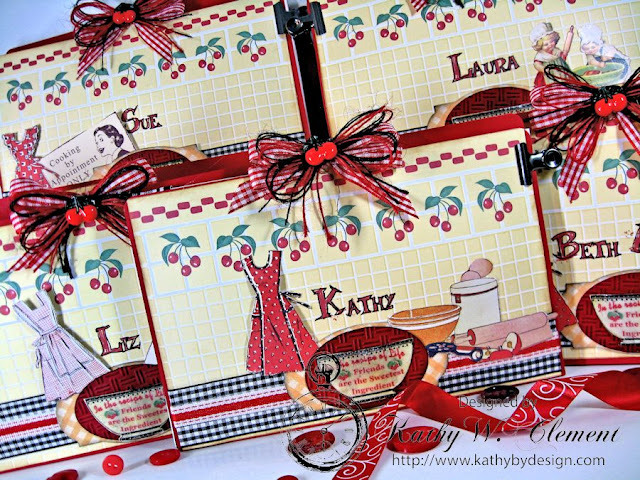 This was a quick and easy way to create a border on each folder. The aprons were fussy cut from Domestic Goddess Creative Scraps and popped up on foam adhesive dots. 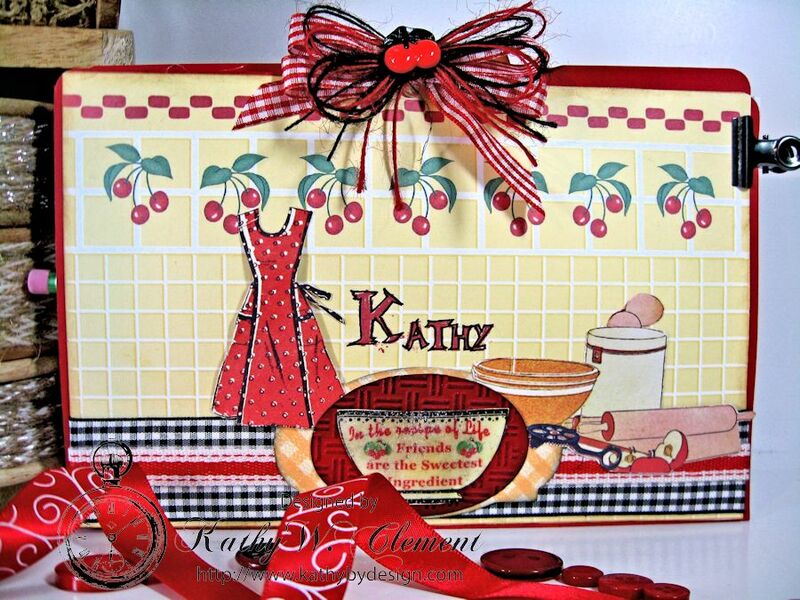 A pretty double bow made from 3/8" Red Plaid Ribbon was topped with a loopy bow made with red and black burlap string. I used my Zutter Bow-it-All to tie all my bows. And of course, I topped it off with a cherry button! Inside, I created a slash pocket on the left. I topped my junior legal pad with Midnight Waves Striped Grograin Ribbon. Again, I ran my Scor-Tape around to the back of the pad and wrapped the ribbon ends behind so that they look nice and neat and will not fray. To create the base folder, I just trimmed my red cardstock to measure 8" wide x 10 3/4" I scored it on the long side at 5" and again at 5 1/4", then folded to form the booklet. Easy peasy! The ribbons and trims made this quick and easy project "party ready." Oh, and the party was soooo much fun! What a great idea - these are adorable.